Dr. Moy has created revolutionary techniques to give patients virtually PAIN-FREE surgery. 100% of patient evaluations are available for patients here. 100% of patients before & after photos here. 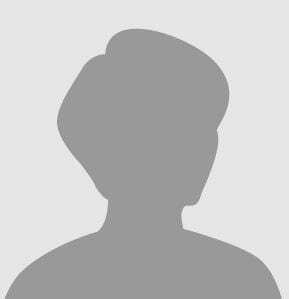 The only foot surgeon who posts 100% of patients evaluation surveys online! More patients come to Dr.Moy for bunion removal surgery mainly for his innovative and highly refined surgical techniques. Click here to see why Dr. Moy’s techniques are so different from other doctors. Check our available schedule to book your group consultation with Dr. Moy for a complete overview and individual evaluation. Click the light bulb icon to select what day works best for you and get stepping in the right direction. Board Certified by American Board of Podiatric Surgery and a recognized leader of virtually pain-free foot surgery, Dr. Moy specializes in pain free bunion removal and other surgical procedures of the foot and ankle. Patients travel from across the country and overseas to visit his state-of-the-art medical facility and benefit from his highly refined surgical techniques. Dr. Moy’s patients agree that he’s a highly skilled expert in his field. As evidence of his widely recognized work, his patients have traveled across the country, even from other parts of the world, just to see the doctor. He continues to differentiate himself from other podiatrists with his virtually pain free bunion surgery technique. As proof that Dr. Moy is a master of his craft, he continues to perform more bunion surgery than any doctor around the world. No matter what the procedure, however, the same thorough attention to detail and expert care is given to all of his patients. Whether it’s for his groundbreaking bunion surgery or other foot and ankle conditions, Dr. Moy blends art and science into a harmonious combination and delivers great results time and time again. When you visit his state-of-the-art facility and meet his handpicked medical staff, you will see why so many people choose Dr. Moy. 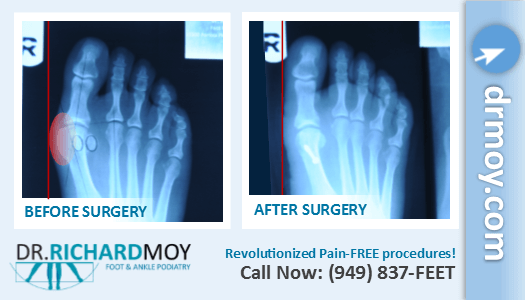 All of Dr. Moy’s patients’ feet are photographed before and after surgery. Patients marvel at how their foot looks and feels following surgery. What a dramatic difference! The photos shown here represent a variety of post-operative stages from the day of surgery to more than a year after surgery. Each photo tells the story of a very happy patient. Bunion surgeon Dr. Richard Moy performs more surgeries than any other doctor in the world. His extensive training and unparalleled experience make him the best choice for performing your bunion surgery. He has an impressive track record when performing bunionectomies, with several thousands of evaluations from former patients available for review. There are over 100 documented ways to remove a bunion, and Dr. Moy has developed a method that is virtually pain free and prevents it from recurring. When it comes to skill in any profession, it is something that is either innate to one’s abilities or is learned through training. However, skill beyond a certain degree is truly a gift. Gifted skill can be seen in many of the professions we see everyday, such as in artists and athletes. Many people who know Dr. Moy, and are in the medical profession, truly believe that he is a gifted surgeon. When looking at results, we find that Dr. Moy’s results are truly remarkable. We believe there is no other surgeon in the world that can produce such consistent results with such a high volume of cases. One of the many reasons he is a successful bunion surgeon is he is extremely focused in the operating room and pays great attention to detail. It was completely worthwhile for me to travel across the country to seek your care, and I experienced no complications or need for further medical care after returning home. You have given me nothing less than a new, healthy pair of feet, and I will always be grateful for your expert overhaul!